In all measurements, we need to be careful that the measurement does not disturb the thing being measured. 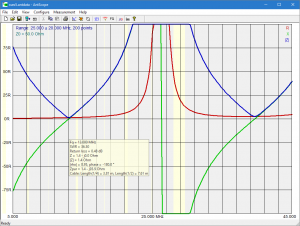 This article explores an example where the instrument measurements appear wrong. The story starts with a mobile antenna that the transceiver indicates has very high VSWR over the 40m band, though starts to decrease towards 7.350MHz. 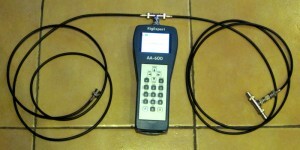 To assist in problem identification / tuning, the antenna connector is disconnected from the radio and connected to the AA-600 analyser and a sweep taken. 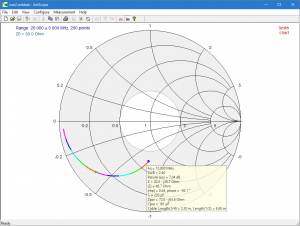 This article explores application of an antenna analyser to a helically loaded 7MHz mobile whip that has an adjustable length tip for tuning. 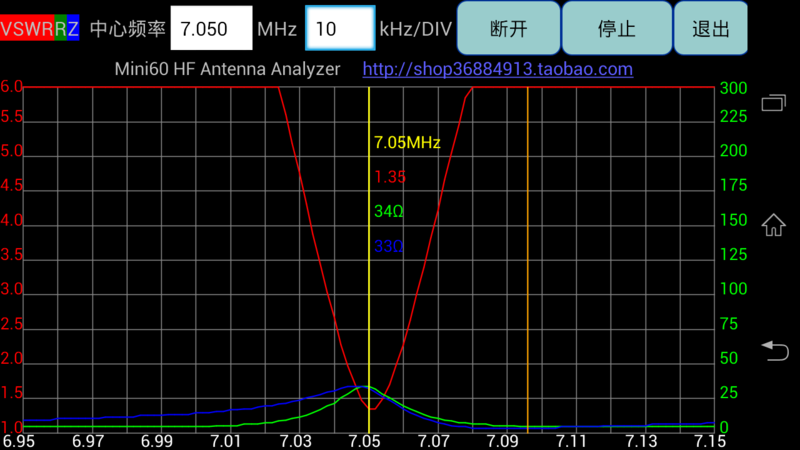 The task at hand is to ‘tune’ the antenna to a desired operating frequency. 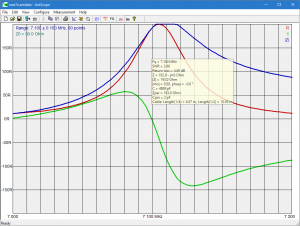 The analyser used is a Rigexpert AA-600, but the article deals more generally with analyser features. 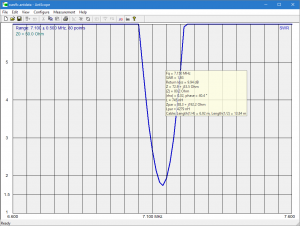 Now one of the methods that is often used to transform the impedance of an antenna to suit a 50Ω feed line is the shunt match. Lets explore that with our test jig reconfigured. 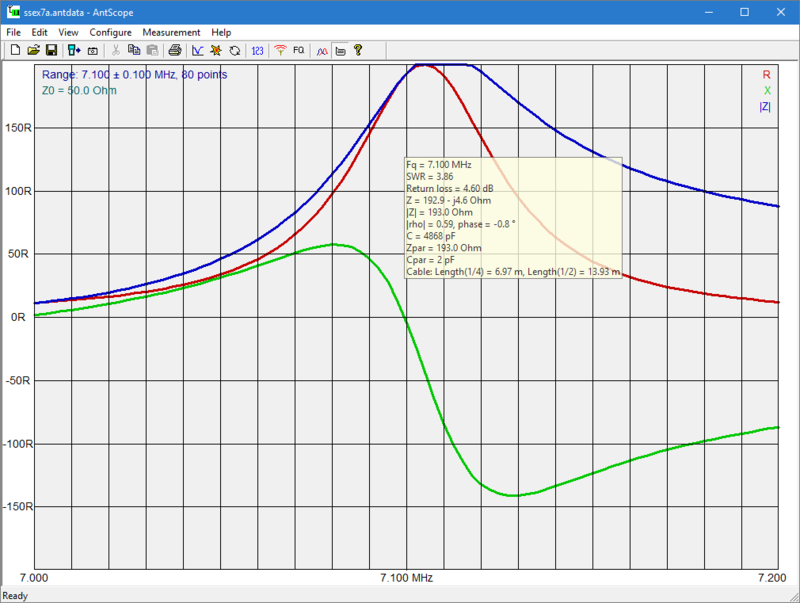 Connect up the two line sections in cascade from the analyser, and terminate it with the two 50Ω loads on the tee piece. 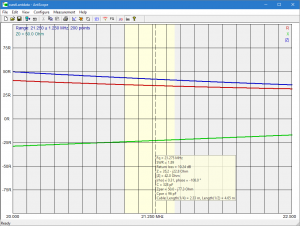 Don’t worry too much about what we have in terms of implementation, it provides a load to the analyser that presents a similar scenario to shunt matching a loaded short monopole. 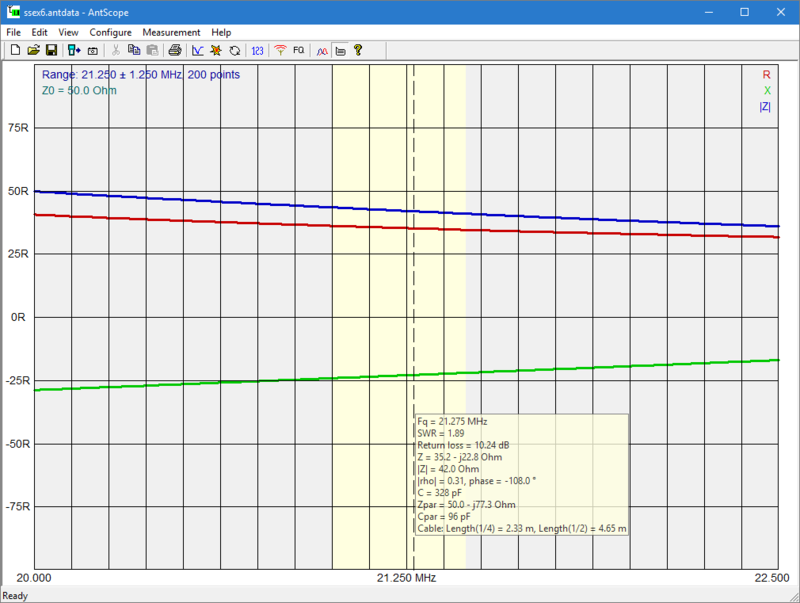 So, measure the input impedance around 21MHz. 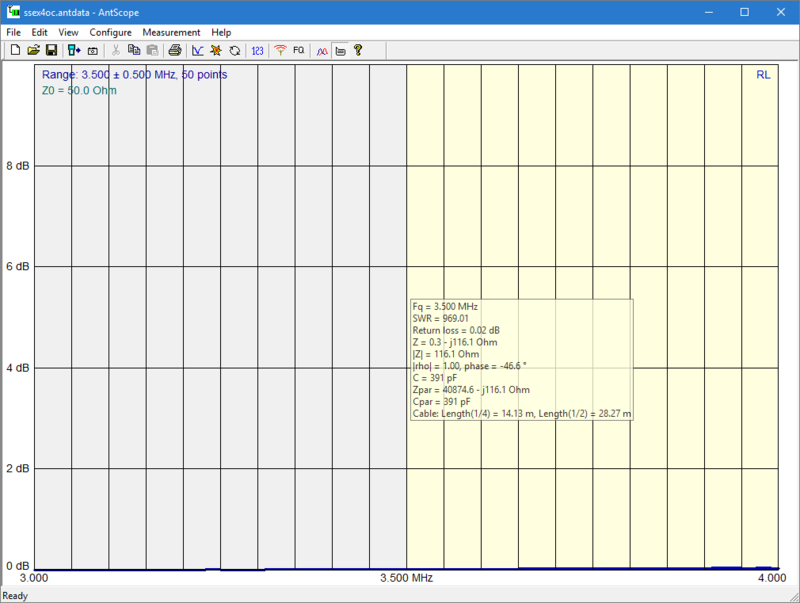 Above is a scan with the Rigexpert AA-600 from around 21MHz. 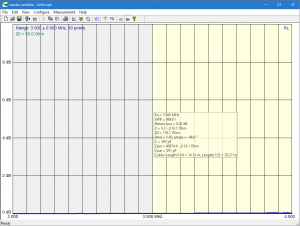 Ignore the |Z| line, it is irrelevant and confusing but I cannot switch it off, a shortcoming of the software. 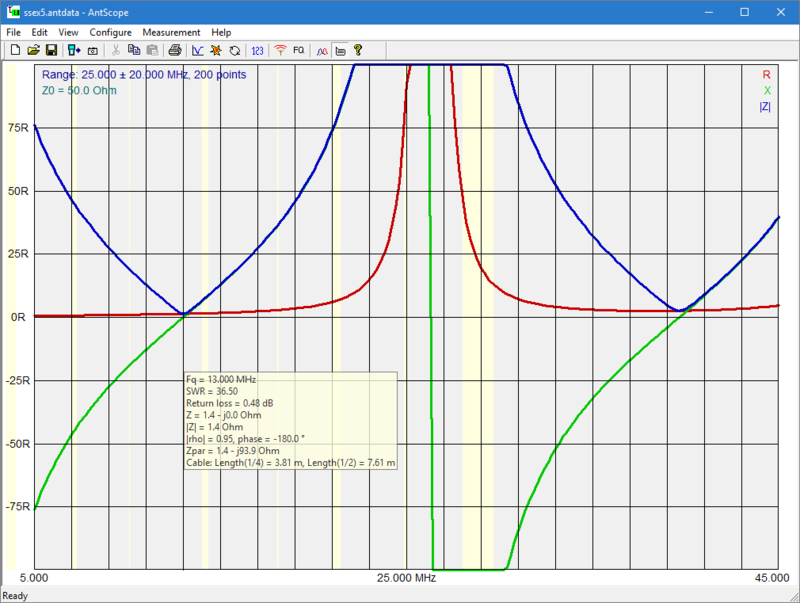 Another method of estimating Matched Line Loss (MLL) from measurement is using the input resistance of a section that is an odd or even number of quarter waves in electrical length. I say estimate because this method depend on an assumption of the value of Zo, and using purely real nominal Zo introduces some error. The required length can be approximated by fining a frequency where X passes through zero. Again, this method is an approximation. It is, a discussed at Measuring matched line loss, a crude approximation (and should be written with ≈ rather than =). It is exact, but there is error introduced in using nominal Zo. 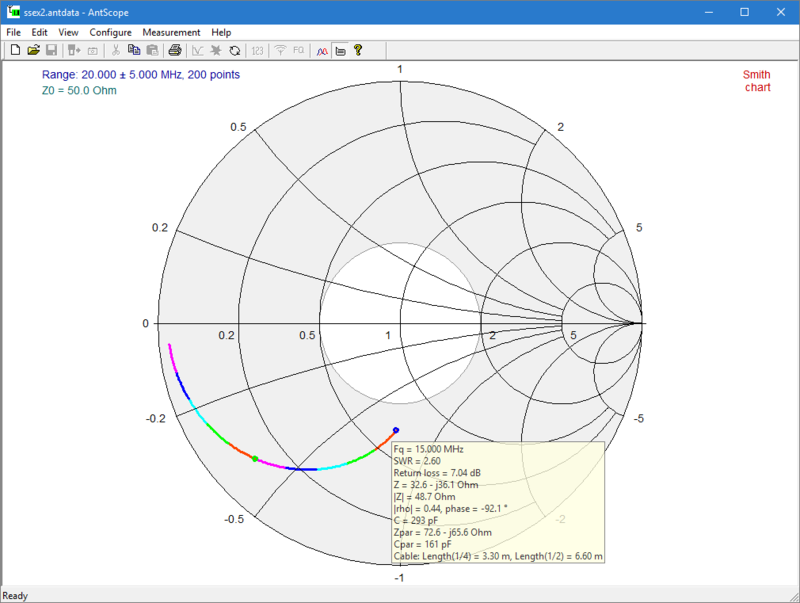 Lets measure Zin of our 4m o/c line section, and find the lowest frequency where X passes through zero, and note the value of Rin. 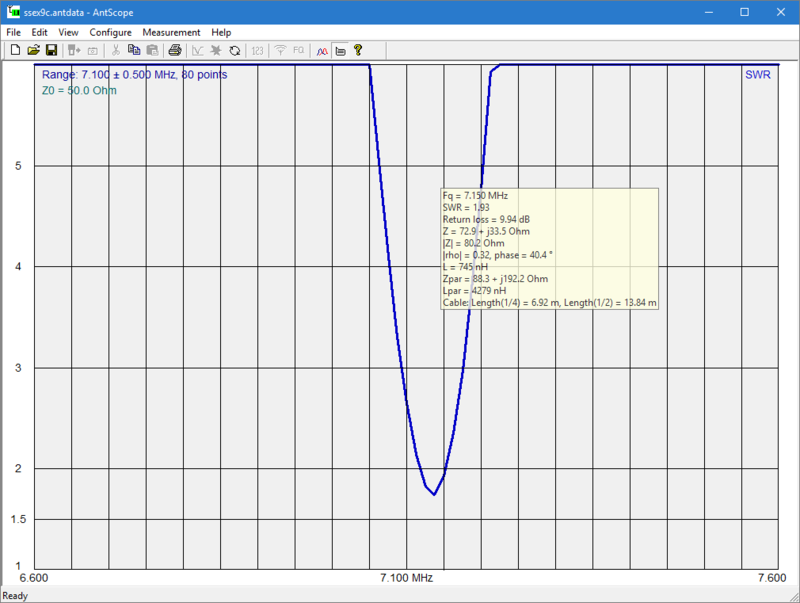 Again in the theme of measuring something known, let us determine the matched line loss (or normally quoted attenuation) of our cable at 3.5MHz. To make the measurement, just connect the two line sections in cascade with a joiner, and one end on the instrument, other end open circuit, and measure ReturnLoss. Most analyser manuals and lots of helpful articles in journals and handbooks will tell you that MLL=RL/(2*length) where RL is the ReturnLoss of an open circuit or short circuit line section (the only requirement is that the ρ=1 at the line end).